Home / world / Find video villains, earn SR55,000. Find video villains, earn SR55,000. 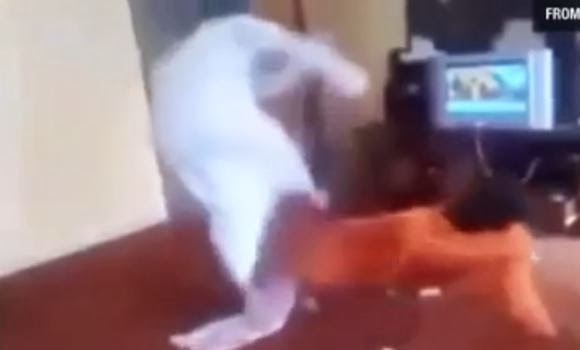 In this screenshot from a video posted on YouTube, an unidentified Saudi man is shown kicking a Bangladeshi cleaner for talking with the man's wife. Rotana TV channel has announced a reward of SR55,000 for anyone who can find the men who appeared in YouTube videos physically abusing expat workers. Three of these videos were recently released on Saudi social media accounts. Citizens and Saudi authorities are on the lookout for the offenders. “We need reliable evidence and clues about the men who were filmed violating workers of different nationalities,” said Ali Al-Olayani of the Ya Hala show on Rotana Khalijia. “This initiative was aired on the show with an initial reward of SR25,000. Abdullah Al-Alami, a human rights activist, called in and donated another SR25,000 for the cause. We received another call from Abdullah Al-Osaimi, a lawyer, offering SR5,000, bringing the total prize money to SR55,000. This amount will be distributed among those who will provide us with clues about the offenders,” he said. Another screenshot shows the Saudi man whipping the Bangladeshi cleaner.